These blocks are made of pine 1 1/2″ on a side, with the wood around the letters carved away, leaving the letters themselves smooth and raised. 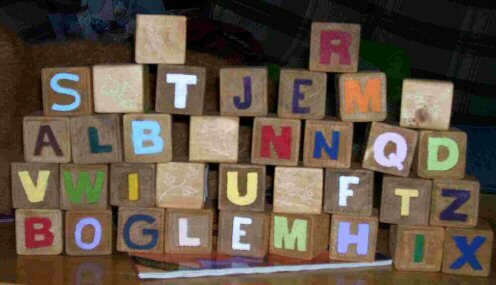 I then stained the blocks by dipping them directly into the can of stain, and painted the letters using a kid-safe acrylic paint. I carved leaf and vine patterns on two blank sides of each block just to break the monotony. There are extra blocks in this set so the mother I gave them to could help her child spell out words needing more than one particular letter. She was very surprised and pleased I made such a thoughtful gift for her and her son, and said they looked great!